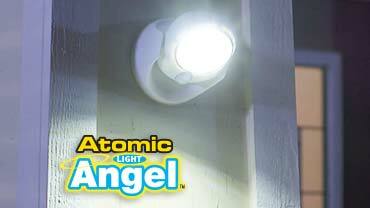 Atomic® Angel | Official Site | The Motion-Activated Light That Shines Atomic Bright! The Motion-Activated Light That Shines Atomic Bright! Shine light where you need it - tilt back-and-forth and swivel 360-degrees for the perfect amount of light. Atomic® Angel turns on with motion activation, and turns off automatically after 30 seconds. Are there places around your home you wish you had a light but don't? Introducing the latest lighting innovation, Atomic® Angel, the motion-activated, cordless LED light that sticks to just about anywhere, lighting up the path atomic bright for you, your family, and your friends. READ FULL DESCRIPTION Atomic® Angel tilts back and forth, and swivels 360-degrees, so you get the perfect amount of light exactly where you want it. The secret is in the technologically advanced motion detector. It activates automatically whenever a person, pet, or automobile crosses its path. Compared to an ordinary light, Atomic® Angel blows the competition away, shining at over 460 lumens. It's the perfect motion light for your front door, back door, or side entrance. It's ideal for lighting up your back yard, making your pool safer, and so much more. You can even use Atomic® Angel to light the interior of your shed or attic. It's motion-activated and uses super bright COB LED panels that have a lifetime of over 100,000 hours. Atomic® Angel turns off automatically after 30-seconds. Installing a hardwired outdoor motion light is expensive and impossible to do on your own. But Atomic® Angel comes with a super adhesive grip that sticks up anywhere and stays up, no matter what Mother Nature throws at it. Light up the night with Atomic® Angel. Get your Atomic® Angel for only $19.99 plus FREE shipping and handling. But wait - double your offer and receive a SECOND Atomic® Angel and LED flashlight. Just pay a separate $19.99 fee. Hurry - this limited time offer won't last long. Order now! FREE Value Shipping Spend $79 or more on qualifying merchandise, excluding gift certificates and taxes. Ship your order to a single address in the 48 contiguous United States. Offer excludes shipping to Alaska, Hawaii, US territories, Canada, PO boxes, AFOs, APOs & FPOs. Orders will be delivered within 7 business days. $5.00 Standard Shipping is the default checkout setting. Your package is expected to be delivered within 7 business days after the items have been shipped and picked up by the delivery carrier. $14.99 Rush Shipping is the second quickest way to get your order. Your package is expected to be delivered within 3 business days after the items have been shipped and picked up by the delivery carrier. $29.99 Next Day Shipping is the fastest way to get your order. Your package is expected to be delivered within 1 business day after the items have been shipped and picked up by the delivery carrier. Check out these other great products by Atomic Angel. OFFER: Get your Atomic Angel for only $19.99 plus FREE shipping & handling. But wait - double your offer and receive a SECOND Atomic Angel and LED flashlight. Just pay a separate fee of $19.99. Hurry - this limited time offer won't last long. Order now! GUARANTEE: Your satisfaction is 100% guaranteed. if you are dissatisfied with your Atomic Angel for any reason, simply return the product within 30 days for an easy refund of your purchase price, excluding shipping and handling. See our return policy for more information. Exceptions may apply.